On a Facebook-group that I belong to, there was recently a discussion with regards to pattern interpretation. It was pointed out that many Taekwondo grandmasters see the forms as nothing more than a combination of blocks-punches-kicks, and that we should not search for deeper or hidden applications in these forms. I make no secret about it, that for me the primary function of the patterns in ITF Taekwon-Do is to teach certain principles of movement, and that they are not primarily templates for fighting. However, I do hold the view that the patterns are artistic artifacts; i.e. works of art. If we believe the forms to be works of art then we must accept that they are open to interpretation as are all pieces of art. The power of art lies not simply in their ability to communicate the artist's original intention, but more importantly, that art can resonate at an individual level with the audience so that each person engaging with good art should experience a unique encounter. For me, I have always considered the patterns to be analogous to poems, and such a view of the forms have helped me gain wonderful insight into them. Having said this, as with all artistic interpretation -- there is no single correct answer; however, there are some answers that are obviously wrong. Similarly with pattern interpretation, it is definitely possible to come up with alternative applications; however, some applications are obviously impractical and / or illogical. Sadly, I've seen all too many such nonsensical interpretations of movements in patterns. It is nearly 2016, and I hope to share some good news soon about my studies. May you all have a blessed festive season and may 2016 be a phenomenal year. It is with a heavy heart that I announce the passing away of our friend Sabeomnim Chris van der Merwe last Friday, 6 November 2015. Sabeomnim Chris has been a pivotal behind the scenes figure in the South Africa ITF community. Over his many years of service he held numerous important positions on the SA-ITF's executive board, such as Secretary General, Information Director, and Constitutional Director; he also functioned as National Team Manager during international championships, as NGB representative at important ITF meetings, as the first webmaster for the SA-ITF, and occasionally as the official SA-ITF photographer. It was particularly in his roles as Secretary General and Constitutional Director that he shaped the very core of the organization. Few members know how fiercly Sabeomnim Chris fought behind closed doors on their behalf; how he embodied being a “champion of freedom and justice” for the normal and sometimes disadvantaged Taekwon-Do students all over the country. Sabeomnim Chris also started the Acestes Taekwon-Do Clubs—one of the largest group of Taekwon-Do clubs in South Africa—and is a founding member of the Dan Gun Kwan with whom the Soo Shim Kwan has very close ties. Sabeomnim Chris' progeny students and co-federation heads Sabeomnim Karel Wethmar and Sabeomnim Annari Wethmar of the Dan Gun Kwan has produced more students to represent South Africa abroad than any other Kwan. Indeed, Sabeomnim Chris has left an enduring South African Taekwon-Do legacy. On a personal note, I have lost a very dear friend. I met Sabeomnim Chris in 2001 at a Dan promotion test. 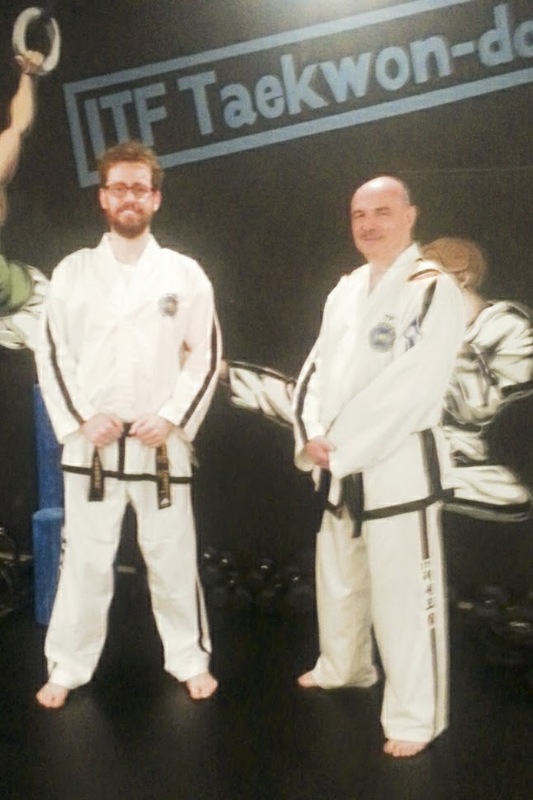 I tested for my second degree black belt; he tested for his first degree black belt. Shortly afterwards I became the webmaster for the SA-ITF, working under Sabeomnim Chris' portfolio, and I took over from him in 2003 as the SA-ITF's Information Director. During this time we became very close friends. During those years I was going through very difficult times (the deaths of family members and loved ones). Sabeomnim Chris was always ready with a listening ear and sage advice. As a friend he also supported my intellectual pursuits and while he never went on to do a doctorate degree, he did much to encourage me to do so—which is something I'm currently busy with. As it was something we often talked about, it saddens me that he will not see me accomplish this goal early next year. Whenever I visited South Africa Sabeomnim Chris and I would make a decided effort to spend some quality time with each other—my visits to South Africa will now always have a gaping hole in them. 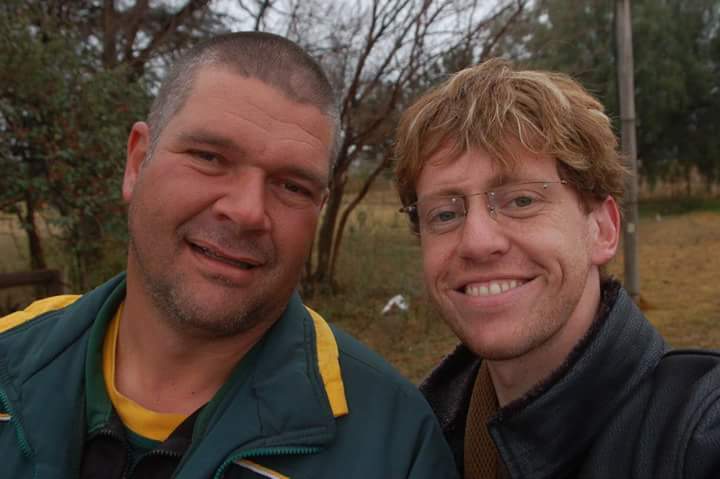 C. S. Lewis is known for saying: “Friendship is unnecessary, like philosophy, art… It has no survival value; rather it is one of those things which give value to survival.” Sabeomnim Chris van der Merwe was an important friend to me that definitely imparted value to my life. And I know that he did the same for many, many other people. He is fiercely loved by hundreds of Taekwon-Do practitioners that were fortunate to be his students and his friends. He will be greatly missed. On behalf of the Soo Shim Kwan I wish to share my condolences to the Dan Gun Kwan, the Acestes Taekwon-Do members, and Sabeomnim Chris' family and friends. We share in your grief. Rest well my friend. Taekwon! I apologise for not writing more regular posts, but I am quite busy with work and studies. Once I graduate, which will hopefully be towards the end of February next year, I will probably write more frequently again. There have been many ideas running through my head that are aching to be expressed. However, recently I've seen a number of people talking about “sine wave motion” again. One person, for instance, wrote on Facebook that one sees all these Taekwon-Do power breaking videos online, but they never use sine wave motion. Another thing I read recently was a small scientific experiment where people punched a bag that was equipped with measuring tools and the subjects punched the bag with sine wave motion and without sine wave motion. The results showed that “sine wave motion” added little to no force to the hits—that the punch without sine wave motion was actually better. To me the statement about breaking and also this experiment is obviously flawed because the vector in these techniques travel horizontally, parallel with the ground. The “sine wave motion” is not intended to add force to techniques that move horizontally. It is pretty simple and I don't know why people don't get it. I think it is because of the wrong appropriation of the term “sine wave.” It is not meant to be understood as an actual sine wave. What General Choi tried to explain was the displacement of the body's centre of mass along the vertical axis—up and / or down. If you also move forward and so displace the body's centre of gravity along the horizontal axis it mimics the motion of a wave, which he referred to as a “sine wave”. It was maybe not the best semantic choice, but don't get stuck on the term. See the principle. What principle? Simply: accelerate as much of your body mass through your technique at the target. That's it. Sometimes this means bending your knees and dropping your weight for a technique that includes a downward vector. Sometimes it means pushing with your legs up for a high technique. Sometimes it means not going up or down but keeping level, as with techniques that travel horizontally towards the target. For me the “sine wave motion” (yes it is a bad term, but get over it) simply means I'm pushing my centre of mass upward or letting it drop downward, depending on the direction the technique is travelling towards the target. Now some might say, that's not sine wave! Their reasoning is that ITF Taekwon-Do's “sine wave motion” always have three parts: down-up-down. Once you understand the principle of relaxation, activation, and execution that is taught through the “sine wave motion” one need not exaggerate them as is often done as a training mnemonic with the “sine wave motion.” The “sine wave motion” is a training tool used to teach principles of motion; it is not a cookie cutter that should be stamped onto every technique. Every sensible ITF practitioner knows this. But enough about that—I've written about the phases of the sine wave motion enough elsewhere; let me quickly explain why I say the above experiment and breaking observations are based on wrong assumptions. The “sine wave motion” contributes to vertical force—the rotation of the hip contributes to horizontal force. If the target is to be reached at a horizontal plane, adding vertical force (through dropping of the body weight) will not contribute to the force of the technique. However, if the target is at a downward angle so that the vector includes a vertical (i.e. downward angled) trajectory, then dropping the body weight will obviously contribute to the technique's power. What people don't seem to get is that a large percentage of Taekwon-Do techniques reach their target not directly perpendicularly horizontal, but often at a slight downward angle. In other words, many Taekwon-Do techniques incorporate both horizontal (i.e. hip rotation) and vertical (i.e. body-dropping) forces. Here are a few examples of techniques to which “sine wave motion” contributes. Obviously, low techniques where the dropping of your body weight into the technique clearly contributes towards the force of the technique, for instance a low punch, low block, or low kick. Most middle techniques too. For instance when doing a punch, the arm is not held up at the top level of the shoulders, but a little below the shoulders, so that the punching arm is not exactly parallel with the floor, but actually angled downwards a bit. Imagine standing in front of somebody your own height and punching them in the solar plexus, the fly ribs, or the kidneys. How should your arm be angled to achieve this? Many people think that the knife-hand side strike where the arm generally ends parallel with the floor reaches the target completely horizontally. This is just one application of the technique and not how I was taught to do it when I started with Taekwon-Do 20+ years ago, nor the main way I teach it. 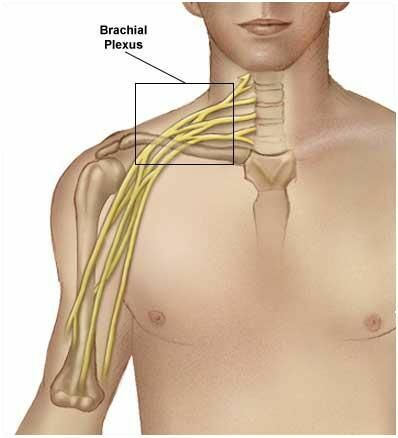 I was taught that it is a strike to the brachial nerve plexus on the nook of the neck just above the clavicle. It is reached with a diagonally angled strike. Examples of similar targets reached with knife-hand side strikes are the solar plexus, ribs and kidneys. Many blocks in Taekwon-Do divert the attack not merely sideways, but rather sideways and downwards. Also, when I started Taekwon-Do over two decades ago my instructor insisted that most kicks should reach the opponent at a downward angle. The sidekick was taught as a “stomp”, the front kick as a “trample”, the turning kick as a “clobber” like with a sledgehammer for which you use gravitation to aid you in the technique. High kicks were never prioritized and even when kicks were performed high, the admonition was that you should hit with gravity as the kick was on its way down. Let me point out that all these examples of "Taekwon-Do work[ing] with gravity" (as my first instructor used to say) are from my basics. These are techniques I learned over twenty years ago in a Taekwon-Do gym where nobody every mentioned “sine wave motion.” I only learned of the term after I had my first black belt. Setting up breaking boards (or measuring equipment) to be hit with fully horizontally moving techniques are flawed, I think. If you want to test if “sine wave motion” (i.e. the dropping of the body weight into a technique) adds to the force exerted by a technique, then you should set-up the experiment for techniques where this makes sense, where dropping the body weight into the technique is actually measured. That's why, when I teach breaking techniques to my students we hold the breaking boards at various different angles and heights. An interest of mine is “Body Culture” (German: "Körperkultur"); basically, the study of cultural ways of moving. Here in Korea where I live, I can often very easily recognize a non-Korean from afar or from the back simply by the way they walk. I can also often accurately recognize Koreans that grew up abroad or lived abroad for a long time. Body movement is “regional” and can be acquired like an accent. Something I am slowly researching is how cultural ways of moving affect martial arts. I've already written a bit about it with regards to the “sine wave movement” on this blog and am currently working on a book about the topic (but it will still be a while before it's finished as I'm focusing on my PhD at present). For this short post, I want to show a small example of the relationship between a culture and their way of moving in the martial arts. The indigenous religion of Japan is Shinto. Although Shinto does not have specific moral “doctrines,” it has a type of moral aesthetic. To quote Shinto priest Motohisa Yamakage: “Shinto conceives of good and evil in aesthetic terms, likening them to straight and curved lines. To the Japanese sensibility, a straight line is inherently beautiful. It need not be rigidly straight, but its emphasis should be forward and positive, signifying organic growth, clarity, and honesty” (The Essence of Shinto: Japan's Spiritual Heart , 2012:44, 45). There is an assumption people have about Karate—that Karate's linear movements developed for practical purposes based on the idea that the shortest distance between two points is a straight line. What if Karate movements evolved to look the way they do not primarily because of their practicality, but because the cultural “sensibility” is that straight lines are “good,” while curved lines are “evil”? One can see something of this in the difference between Karate as it is practiced in mainland Japan where Shintoism is particularly emphasized, as opposed to on Okinawa. I propose that while this might be a weird concept to accept for people unfamiliar with body culture, it becomes less strange once you start to look at the dances cultures. I have asserted before that there is a connection between Korean folk dance, Taekkyeon and ITF Taekwon-Do. They all share a particular Korean three-beat rhythm and a peculiar “bounciness”, or what is known in Korean folk dance as “verticality”. When one looks at Japanese performing arts and dances, one can also see similarities with Karate. Neither is it surprising that Chinese martial arts and Chinese performing arts (Chinese opera) greatly overlap. The idea that in the traditional martial arts we move in certain ways, that kata or patterns are performed in particular ways, strictly based on efficiency or practicality of technique is an assumption. I'm not denying that practical considerations are indeed part of the way the martial arts move, but one cannot deny the influence of a cultural context of the martial arts—of body culture. There are reasons all the martial arts around the world do not look and move the exact same way. If it was all about the most “effective” technique, then there should have been much more uniformity. The cultural context has a big influence on the body culture, and in turn on the martial arts that developed in those cultures. Body culture may be influenced by such obscure things as an aesthetic appreciation of straight lines over curved lines, or the cultural folk rhythms, and many other variables. What does this mean for martial artists? For one, there is a difference between a martial art which is embedded with a cultural heritage as opposed to a pure (if such a thing exists) combative system. The next time you practise Taekwon-Do, or Shotokan Karate, or Whin Chun, or Capoeira, or Savate, to name just these few martial arts as examples, know that you are not simply learning fighting techniques, you are also learning a particular cultural way of moving your body—you are in fact learning a body culture. 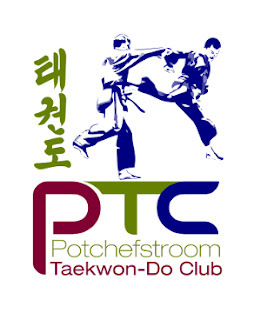 The Soo Shim Kwan is very happy to introduce the new logo for the Potchefstroom Taekwon-Do Club (PTC). I started the club in 1998 at the North West University, in South Africa. 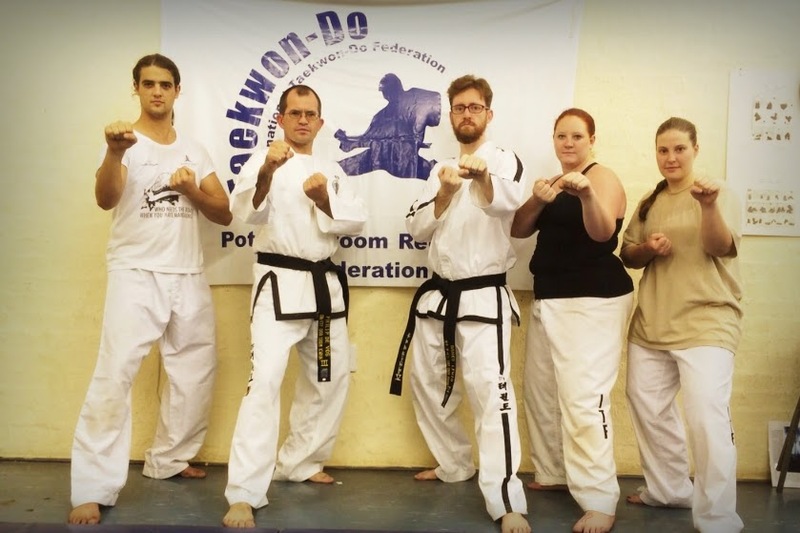 It is out of the PTC that the Soo Shim Kwan (originally "Potchefstroom Regional Federation") was established in 2001, and so the PTC remains the Soo Shim Kwan's main dojang. The reason for this is twofold. First, as mentioned already, it was the birthplace of our federation; and second, it's affiliation with a university contributes to our goal of "an intellectual understanding and scientific approach to Taekwon-Do" (See the Soo Shim Kwan Charter). The PTC is currently under the great leadership of Instructor Philip de Vos who, as a mechanical engineer, continues this legacy. The new logo was in part inspired by the logo of the North-West University, to indicate our long standing association with this institution. The green, red and blue colours are in darker hues, to echo the dark blue used in the Soo Shim Kwan logo, in which the "dark hue signifies maturity and wisdom." The colours themselves reflect not only the corporate colours of the North-West University, but also resonate with some of the colours used in the ITF Taekwon-Do belt system. The sparring figures, with one fighter throwing a punch and another a jumping back piercing kick, were chosen to symbolize ITF Taekwon-Do's balanced emphasis on both hand and foot techniques. The presence of the Korean calligraphy of the founder of Taekwon-Do, General Choi Hong-Hi, symbolizes our affinity to the style of Taekwon-Do that he orchestrated and its associated Korean heritage. The first draft of the logo was designed by myself, and aesthetically improved by my once Taekwon-Do senior turned friend, John-Wesley Franklin. Copyright of the Potchefstroom Taekwon-Do Club logo belongs to the Soo Shim Kwan. All rights reserved. There is nothing wrong with practicing martial arts simply as a hobby and recreation. However, there is definitely a difference between those that practice the martial arts as a recreation and hobby, and those for whom it is a 'Way of Life.' When the martial arts become a 'Way', a 'Discipline', it becomes a wonderful journey of self-discovery and growth that transcends simply kicking and punching. My brother and I started our martial art journey together. Unfortunately circumstances have caused him to simply not have the time to devote to martial art practice. For me it was a little different in that when life threw its hardest curve balls at me, the martial arts provided a form of escape, a way to feel normal, a way to deal with the stress. When I went to the dojang, I could forget about not having money to pay my rent, or I could vent my anger through hard training, or I could alleviate depression through the endorphins released from exercise, or I could escape from my isolation through the interaction with fellow martial artists, or conversely sometimes when I wanted to get away from the people I lived with (I used to live in a commune) or the people I worked with, I could go to the dojang. The dojang became a sanctuary of sorts that helped with many problems. But, not all people find such comfort and support from martial arts training. For them it might be found in something else--another activity. After my 2nd Dan promotion, the examiner gave a little speech to all the candidates. I still remember it, even after so many years has passed. He said that in life priorities will change. Some people, when they get married and have children, or might relocate, start a new job, or something else, and they might choose to give up the martial arts, and that is okay. I agree with him. The martial arts need not be a life long pursuit. For some people it is just a hobby. However, it might be much more too. It might be a discipline. What the Koreans call "suhaeng" 수행. This is a type of practise, generally a physical practise aimed at mental discipline. For Koreans calligraphy, flower arrangement, or the tea ceremony, and of course many forms of martial arts, may be suhaeng. In Japan, nearly any activity can be considered such a discipline. The idea is to practise and practise and practise a particular activity until it becomes so ingrained, so natural, that it reflects the natural Do, the Tao. When you have mastered your craft to such a level, it has become much more than simply kicking and punching, pouring tea, arranging flowers, or painting characters on rice paper. It becomes a symbol for life itself. A type of meditation and a means to enlightenment. Often times, when it was a long week, or I'm over worked, I might not feel like going to the dojang--to go kick and punch, to repeat patterns, to practise rolls and break falls, to do the same old basic motions that I have done thousands of times. Not to mention the hour long one way commute it takes me to get to the dojang: the fifteen minute walk to the bus stop, the bus ride, the train ride. After a long day at work that is not something I look forward to. Nevertheless, I go. I go because it has become part of me. I've been practising martial arts regularly for the greater portion of my life. It is a integral part of my life. It has shown me the value of discipline, of starting something and keeping at it, of not quitting even though I might feel like it. Recently one of my students who now joined the military posted the following on his Facebook feed. The Army had me suffering from Taekwon-Do withdrawals. I miss the intensity, the spirit and perseverance of training in South Korea. 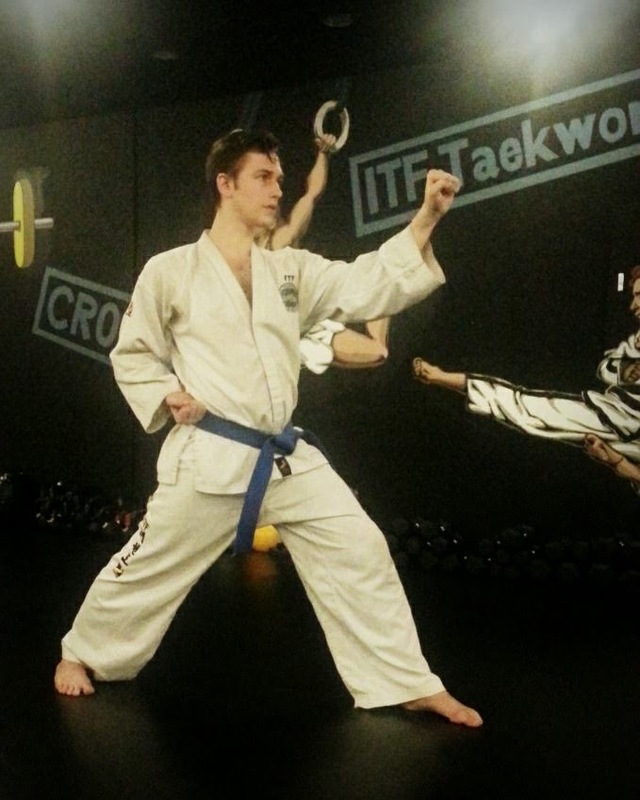 In retrospect I can honestly say that Taekwon-Do has helped me tremendously to overcome and excel the physical and mental challenges that Army training has thrown at me this far. Every time I feel demotivated I turn my CTA or drill pad into a 'dojang'. When I run I turn my two mile into 'dojang'. When I shoot I turn it into 'dojang'. When I have to stand at attention I turn those 30 plus or 15 minutes into 'dojang'. When I have to control my emotions I think about those time I got kicked in the face, concussions, back pains, and kicked in the stomach while controlling my emotions in 'dojang'. I always talk about Taekwon-Do at every opportunity and training alone is not as fun. But this is one habit I never want to lose. Thank you Sahbumnim Kim Hoon and Soo-Shim Kwan for helping me achieve this. He too had found the value in suhaeng. I won't be so brash to say one cannot find such lessons in other disciplines too, but the martial arts do present unique moments for growth. Having to control one's emotions after being kicked in the face is probably quite different from being pricked by a thorn while doing flower arrangement. 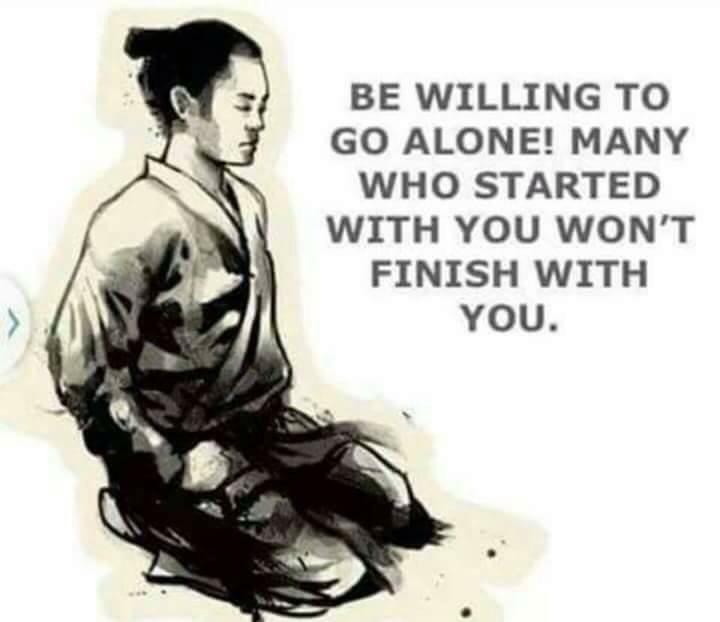 The martial arts is a unique journey. It is not for everyone, but keeping at it can definitely be rewarding. Priorities change and if that is the case for you, then be at peace with that. It is okay. Find your passion. One of my friends with whom I used to practise Hapkido, had a long struggle between Hapkido and his music (he is in a band). He couldn't find a balance between the two and eventually had to choose. He chose music. I'm happy for him, and although I know that he misses martial arts, the rewards he gets from following his music passion outweighs his lack in martial arts training. For him it is music that is his true suhaeng. Some people can find that sweet balance between multiple priorities. That is wonderful; but if you can't, it might be better to choose. It is better to follow the Pareto Principle, and focus on the few things that bring the greatest result. 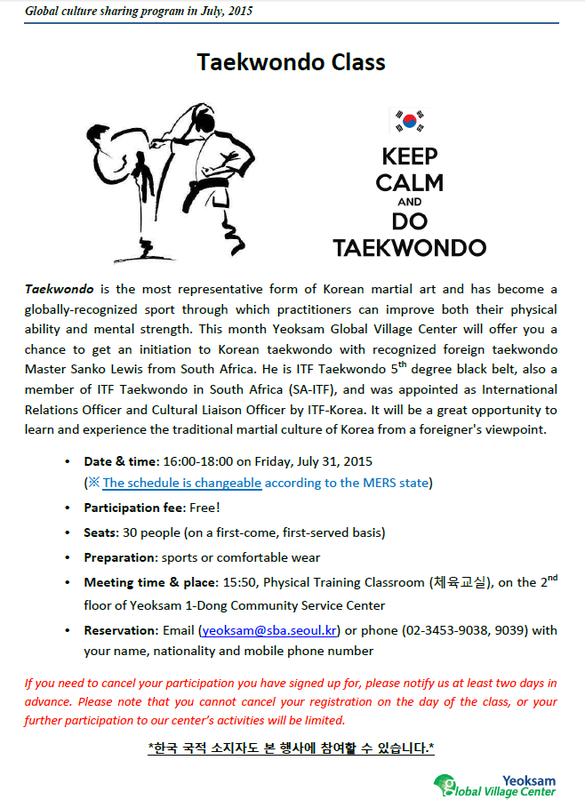 I'll be teaching an Introduction to ITF Taekwon-Do Workshop on behalf of the Seoul Global Village Center, Yeoksam Branch, in Gangnam, Seoul next Friday, 31 July. Participation is free but the space is limited. There is still some space left though, so if anyone is in the area and interested, please contact the Yeoksam Global Village Center directly via the contact details provided in the image below. 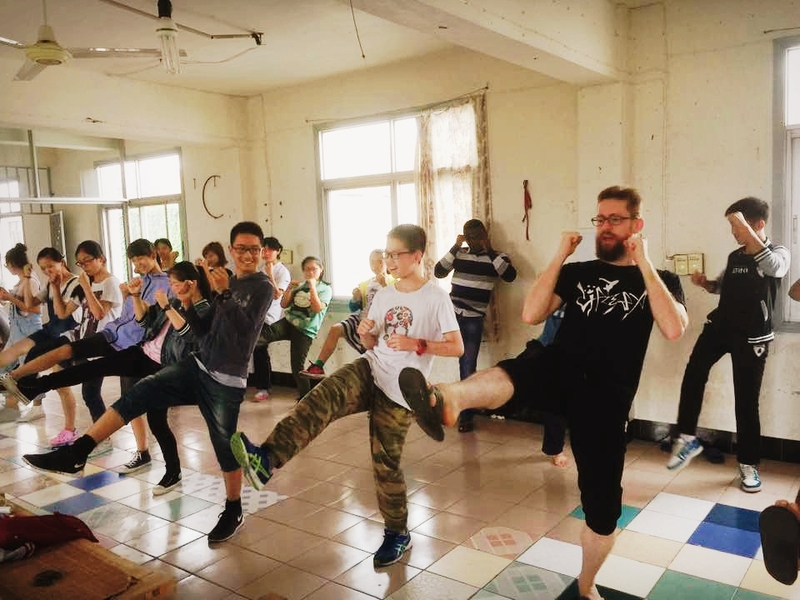 During my recent trip to China I participated in a nine day long camp with (mostly high school and college aged) Chinese students, who I taught various classes. Among the classes I taught were basic martial arts -- a combination of Taekwon-Do and Hapkido. They enjoyed a lot. I focussed mostly on low kicks, basic strikes, and some joint manipulation. With some of the older students who had a little Taichi Quan experience I did slightly more advanced techniques, including pushing hands drills. In Korea where Taekwon-Do is losing popularity, Taekwon-Do is gaining popularity in China. Taichi Quan, it seems, is now associated with training for "old people". The opposite is the case in Korea, where Taekwon-Do thought of as a kids activity. I recently saw a Bruce Lee interview again in which he advises one to become like water. Of course, this immediately made me think about our federation's name: "Soo Shim Kwan" [水心館]. The Chinese characters 水心 that is pronounced Soo-Shim 수심 in Korean, literally translates as Water-Mind. In 1997 I had read an interview in Tae Kwon Do Times in which the Korean concept of Soo Shim was mentioned. It very much resonated with me, and I knew that if I ever have the opportunity to start my own group, that is the name I'll choose as it represents my understanding and approach to the martial arts. These water analogies found in the works of Taoist authors and other Oriental philosophers and also implied in the teachings of great martial artists have always been very important to me. Now, as I live in Korea and study Oriental philosophy, I'm even more convinced about the appropriateness of the name Soo Shim Kwan. Ironically, few Koreans are familiar with East Asian philosophy and not many know much about even Korean philosophy. When I mention the term Soo-Shim 水心 to the average Korean, they are unlikely to understand the philosophical meaning. One of the meanings of Soo-Shim, based on a different Chinese characters combination denotes the "depths of the ocean" 水深. This is often what Koreans think of when I say Soo-Shim. Another meaning of Soo-Shim, based on another Chinese character combination is "anxiety" 愁心. Unfortunately the study of Chinese characters is not part of the modern school curriculum in Korea anymore. It is, however, the older, more learned Koreans whom have studied the old Chinese characters that immediately grasp the philosophical meaning of our name 水心, and often nod in approval. I provided a summary of the meaning of our name on our Philosophy page. A very big congratulations for the great performance by Soo Shim Kwan's Horangi Dojang at the South African National Open Championships that took place in Randburg recently. 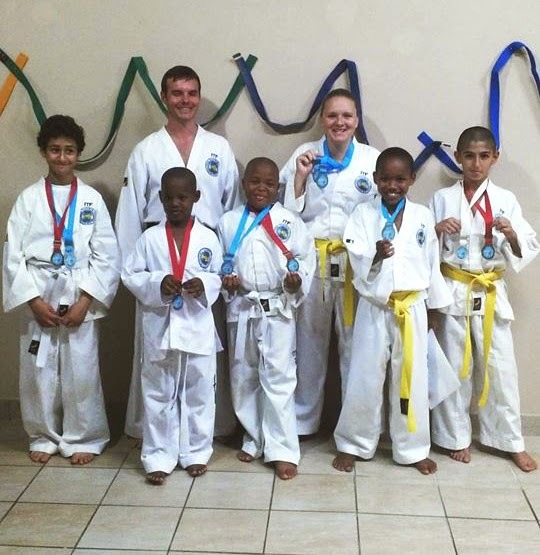 Instructor Gerhard Louw reported that: "Out of 7 students we brought home 7 gold medals, 2 silver medals and 1 bronze. Maria Ramona Truter performed outstanding by getting 3 gold medals and Best Veteran female of the day trophy. I am extremely proud of you all." Congratulations Instructor Gerhard, you and your team are hot stuff! A big congratulation to the Soo Shim Kwan - Potchefstroom Dojang for their great performance at the 14th ATC Annual Invitational Tournament that was held at the end of May in Pretoria. 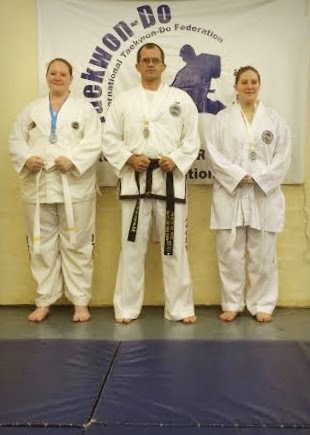 Instructor Philip de Vos won gold for III Degree Patterns; Hatting Davel won gold for Special Technique Breaking, silver for Patterns, and bronze for Power Breaking; Adelle Wolmarans won silver in Power Breaking; and Riana Serfontein won gold in Patterns and bronze in Power Breaking. Well done! You make me proud! Over the weekend of 9-10 May I had the privilege to attend the 5th International Symposium on Taekwondo Studies, sponsored by the WTF as a precursor to the 2015 WTF World Taekwondo Championships in Chelyabinsk, Russia, and organized by the International Associationfor Taekwondo Research, It was particularly heart-warming that at least three of the speakers at the event were ITF Taekwon-Do practitioners and scholars: myself, Dr George Vitale (who was a keynote speaker), and Dr John Johnson (who was one of the main organizers and master of ceremonies). The WTF Championships' opening ceremony also included an ITF Taekwon-Do demonstration. Later ITF and WTF practitioners demonstrated basic movements together -- a very symbolic act. The reason for my attendance was to present a paper and a poster at the symposium that preceded the WTF World Champs. I represented the university where I work, and also Kyunghee University where I am currently enrolled into a PhD program. 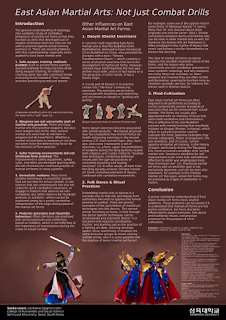 My poster was concerned with the influences in martial art forms. 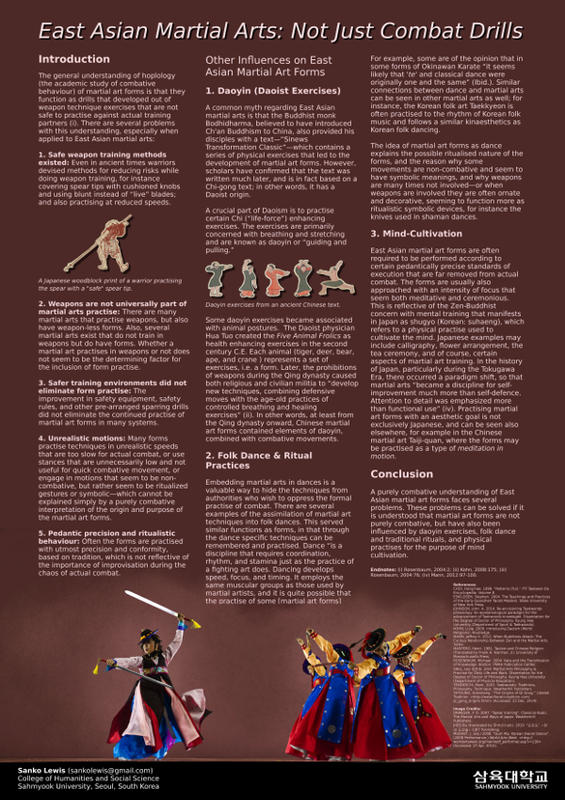 I argued that understanding East Asian martial art forms as simply combat drills result in several problems. To solve these problems one have to consider other influences that contributed to the development of the forms, which include Daoyist exercises, folk dances and ritual practices, and East Asian conceptions of mind training through physical activity. The paper I presented concerned another topic, namely pacifism and war ethics. The title is "The Paradoxical Pacifist Teachings of East Asian Martial Arts." Basically, East Asian martial arts admonish their members not to engage in fighting, or that the highest goal of martial art practise is not fighting. This is paradoxical since the core focus of martial art practise is combative techniques. I argued that the reason East Asian martial arts (as apposed to Western combat systems) teach combat avoidance is because they are based on the pacifist teachings of East Asian philosophies such as Taoism, Confucianism, Mohism and Buddhism. I furthermore continued to show ways in which this paradox can be overcome by means of normative ethics. This paper is part of my research for my PhD dissertation, which I need to submit--God-willing--by October this year. I have finally completed all my coursework and a few weeks ago I wrote my comprehensive exam and obligatory foreign language exam. I'm thankful that I passed both, since nearly half of the attendees did not pass the comprehensive exam. Unfortunately, because I'm so busy with work and studies, I'm not getting to write here as often here as I would like. For what it is worth, I have several writing topic ideas just waiting for an opportunity to be written. The very first book about Taekwon-Do was written and published by Gen. Choi Hong-Hi in 1959. This "lost" book will soon be made available to the general public. Most people don't know about this book and very few have seen it. For most, the oldest resource on Taekwon-Do has been the 1965 book (also written by Gen. Choi), of which one can still buy reprints. The difference between the 1959 book and the 1965 book is not small, and it is not merely a difference in language, keeping in mind that the 1959 book was written in Hanja (Chinese characters) and Korean. 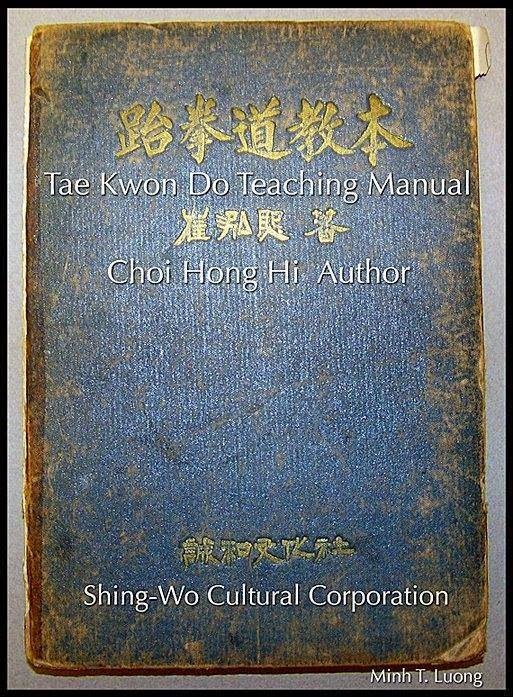 I have been privileged to have received an initial digital version of the first Taekwon-Do textbook and find it fascinating to notice that although Taekwon-Do was obviously very Karatesque at that time, even at this early stage we can notice some of the germs of what would become Taekwon-Do as a Korean martial arts -- for instance, several photos depicting flying kicks. This year, 2015, on April 11th, on the 60th anniversary of the founding of Taekwon-Do, this first Taekwon-Do textbook will be made available for download as a PDF. 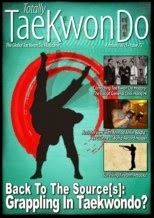 The book will be provided by Taekwon-Do historian, Dr. George Vitale on his blog: HistoryOfTaekwondo.Org. Dr Vitale is an 8th Dan ITF master, and one of the foremost Taekwon-Do historians in the world. I had the good fortune of recently spending some time with him again. His passion for Taekwon-Do and its history is contagious, and him sharing this invaluable resource is typical of his character. He is on a mission to educate the world of the true history of Taekwon-Do and now you can be a part of that too, by downloading the first ever Taekwon-Do textbook. One particularly grand thing about it is that on one of the very first pages of the book you can also see the very first calligraphy of Taekwon-Do, written in hanja as 跆拳道 by South Korea's first president, Syngman Rhee. This historic work of art acted as the official approval of the new name "Tae Kwon Do", and what would become Korea's national sport and one of the most widely practised martial arts in the world. The Soo Shim Kwan is happy to congratulate the Potchefstroom Dojang with its recent victories at the 2015 Gauteng North & Northern Provinces Provincial Tournament that was held on Saturday 21 March 2015 in Pretoria, South Africa. Instructor Philip de Vos again won gold in patterns. 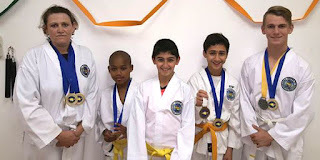 His students Riana Serfontein and Adele Wolmarans also won medals, gold and silver respectively, in their patterns division. Congratulations! The Soo Shim Kwan is proud of Instructor Gerhard Louw and the students from the Horangi Dojang in Groblerdal, who recently participated at the Northern Gauteng and Northern Provinces regional tournament in Pretoria, South Africa. The six Horangi participants won 10 medals in total. Well done to you all! Kyongbuk Science College < http://golfma.kbsc.ac.kr/ > is the first university in South Korea to offer a major in Mixed Martial Arts. Kyongbuk Science College has produced many famous athletes such as the Korean Zombie, Jeong Chan-Seong, Im Hyon Seong, and others. In 2015, for a more systematic education, the university is interested in recruiting two well rounder foreign (non-Korean) instructors with extensive experience in Brazilian Jiujitsu and Muay Thai respectively. The candidate must be able to communicate and teach martial arts concepts in a clear, well structured way to young athletes that use English as a second language. with proof of BJJ teaching experience. Previous exposure to an MMA environment may be useful. and proof of Muay Thai coaching and competing experience. Responsibilities: The teacher will lecture and coach students in the Sports Department. Remuneration: 2, 000 000 ~ 3, 000 000 Won (Roughly US$2000-US$3000) per month depending on degree and experience. Housing: Dormitory housing on campus will be provided. Duration: One year contract, with the possibility of renewal. This is the last post for the time being on the kinaesthetic value of the ITF patterns and was published in Issue #72 of Totally Tae Kwon Do Magazine. In my previous discussion of the value of the ITF patterns I discussed the emphasis put on accelerating as much body mass as possible in order to achieve greater force. There is however a danger in over-zealously forceful techniques, which will be the discussion of this instalment. ITF Taekwon-Do has an obsession with power generation. Fundamental Movements are often idealized techniques for generating tremendous amounts of force by accelerating as much body mass as possible in the direction of the technique, be it block, punch, strike or kick. Although generating force is the primary goal, it is trumped by keeping proper posture and maintaining balance. The ITF practitioner wants to generate as much force as possible, but without compromising posture and balance. Fundamental Movements, as practised in the patterns, are a way to practise powerful techniques; however, the power is curbed just enough to maintain good posture and balance. leaving him in a potentially compromised position. Let’s look at some examples. Imagine punching a target, such as a punching bag, as hard as you possibly can. Now imagine doing the same, but just before your fist hits the punching bag, someone suddenly pulls the punching bag away. What is likely to happen? It is likely that the momentum of your punch will swing you off balance. Another example: consider doing a turning kick as hard as possible to kick “through” the target. Let’s say your target is again a punching bag and you kick it with all the force you can muster. And rather than snapping the leg out and back as you hit the target as is the common practise in Taekwon-Do, you instead drive through with all your body mass—in effect doing a Muay Thai style roundhouse kick. And again, just as you are about to land the kick, somebody moves the bag out of range; once more you are likely to be thrown off balance, the momentum of the kick probably pulling you around exposing your back. A tutorial for the Muay Thai roundhouse kick. The Fundamental Movements as practised in patterns teach us an important principle, that while power generation is very important, it should never happen at the expense of good posture and balance. The Muay Thai style turning is indeed more powerful than the Taekwon-Do turning kick because it has much more momentum and drive through than the snapped turning kick. However, the snapped turning kick with the reaction force of the arms that are pulled in the opposite direction maintains much better balance and posture, whereas the momentum of the Muay Thai roundhouse kick causes the practitioner to turn and expose his flank and back, resulting in compromised positioning. Similarly, the over zealous punch also throws the practitioner off balance, whereas the traditional martial art punch that we practise in Taekwon-Do (and similar styles such as Karate) remains full facing, rather than over extend. Certainly doing a punch as a boxer that uses big rotational forces of both the hip and the shoulder would be much more powerful. Why then does Taekwon-Do and other traditional styles often only use hip rotation, rather than also full shoulder rotation, to punch? Why do we emphasize staying mostly full-facing during our punches, when pushing the shoulder forwardwould result in deeper penetration and more force? As I pointed out before, posture and balance trumps power. Another example we notice in blocking techniques, which are generally in a half-facing posture. A further rotation of the hips into the full-facing position would usually make the block more powerful. Over-zealous blocking are nevertheless avoided, as the benefit of a slanted body angle which reveals less of the body’s surface area and vital points outweighs the possible benefit or more hip rotation that would increase the power of the block. The Fundamental Movements as practised in the patterns teach us that the benefit of more power does not surpass exposing more vital spots. Why is it that a martial art like ITF Taekwon-Do that is so obsessed with powerful techniques would so often curb its Fundamental Movements in order to maintain good posture, positioning and balance; while other styles like modern western boxing and Muay Thai throw all they have into some of their techniques? The answer is most likely to be found in Taekwon-Do’s original purpose as a system aimed at self-defence, rather than a martial sport. An over-zealous swinging punch in boxing or a big Muay Thai roundhouse kick that spins you around exposing your back to your opponent is a risk worth taking in a sport context. If the technique lands it may knock out your competitor and cause you to be the victor. If the technique misses, you may expose your back to your opponent or lose your balance and fall; however, that is a risk a competitor may be willing to take. Tournament rules prohibit lethal attacks to the back of the head or spine or kicking a fallen opponent, and there is also a centre referee who will look out for your well-being. Even in UFC, known for its brutal and high intensity tournament fighting that is often touted as “no holds barred,” strikes to the spine and back of the head or attacking the head of a downed opponent is illegal. While there is a risk in using over-zealously powerful techniques that may compromise your posture and balance, it is a risk often worth taking by martial sport practitioners because in a sport context it is nearly never a lethal risk and such techniques have the potential to ensure a victory. However, in a martial art concerned with self-defence such over-zealous techniques that compromise balance and posture are particularly avoided. In a self-defence (i.e. life-or-death) situation, the last thing you want to do is to allow your attacker access to your back, or find yourself on the floor if it could be avoided. Traditional martial arts are therefore often conservative with regards to their Fundamental Movements when it comes to posture and balance. Taekwon-Do is known for many “flashy” techniques. While such techniques are often encouraged in sport settings, the Fundamental Movements as practised in the patterns are by contrast very conservative. The patterns contain almost no risky, flashy techniques. In the patterns the practitioner is encouraged to practise power generation, but always in a controlled way, so as not to compromise posture and balance. See also my article "Taekwon-Do Kick versus Muay Thai Roundhouse Kick" and Dan Djurdjevic's article on why traditional martial arts tend to stop their techniques at predetermined points. Although Korea is the motherland of Taekwondo it is ironically often difficult to find serious Taekwondo classes, as Taekwondo schools usually focus on children and sport rather than the original martial art / self-defence focus. For foreigners it is further challenging because it is very difficult to get instruction in English. However, there are places in Korea where adults can train in Taekwondo with focus on martial art and self-defence, and taught in English. The ITF Taekwondo training at 'The Way' Martial Arts & Fitness Gym in Seoul (close by Ttukseom Resort and Konkuk University) is officially kicking off again, start of March. The class is very “foreign friendly”, as instruction is conducted mostly in English. 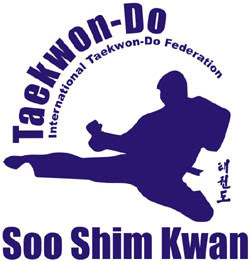 The Taekwondo training follows the International Taekwon-Do Federation (ITF) syllabus, following the Soo Shim Kwan philosophy. ITF style focuses on martial art, rather than martial sport, and includes practical self-defence techniques. The class is also augmented with techniques from Hapkido. Practitioners learn traditional martial art techniques based on Newtonian scientific principles. The practitioner is then progressively taught how to adapt traditional martial art motions into practical self-defence techniques. The syllabus covers a full arsenal that includes strikes and punches, elbow strikes, various kicks and knee attacks, throws, joint-locks and escapes. The instructors have decades of martial arts teaching experience and have presented seminars internationally. Both Master Kim Hoon (8th Dan) and Instructor Sanko Lewis (5th Dan) have received honorable mentions (“citations”) from the Taekwondo Hall of Fame, and both have written extensively on Taekwondo and the martial arts. 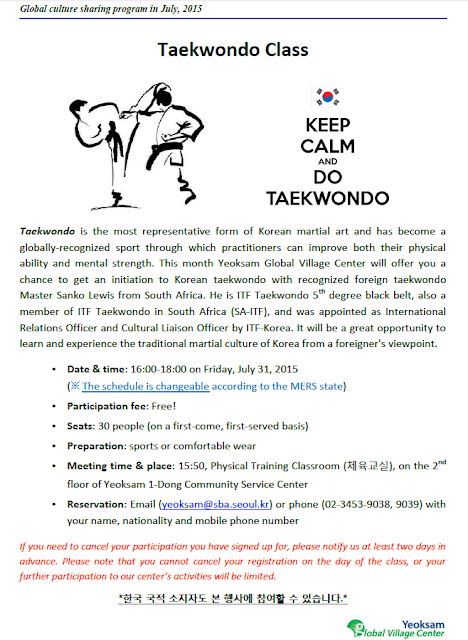 This is a unique opportunity for foreigners to learn an established and battle proven Korean martial art. If you always wanted to learn a martial art, now is your chance. See you in March! I was in Pretoria last week and got to visit Sabeomnims Karel and Annari Wethmar, and Boosabeomnim Chris van der Merwe. On Thursday night I visited ATC Pretoria Dojang where I presented a workshop similar to the one I did at the Soo Shim Kwan Potchefstroom Dojang the week before, focussing on ground work (break falling and rolling), joint mobility and posture, and some thoughts on the Golden Move. I also spent a little time on the sine wave motion and how to ensure it is practised and applied sensibly. Afterwards there was a nice Q&A session. The Dan Gun Kwan (ATC) and Soo Shim Kwan friendship has come a long way. Not only do we have our promotional tests together, but we also share seminars. Whenever I visit South Africa I'm always invited to ATC to share some of what I have learned during my stay in Korea. I'm always honoured to do so, and very much enjoy their hospitality and the students' eagerness to try new and somewhat unconventional things. Last week Thursday I visited the Soo Shim Kwan Dojang in Potchefstroom during my visit to South Africa. Since it is still early in the year and many of the university students have not returned from vacation yet, there were only four in attendance. It was nevertheless nice to meet new members of the Soo Shim Kwan family. During the session with them I covered some ground work (break falls and rolls), and spent some time on (power) posture work in Taekwon-Do and the importance of balanced musculature, pointing out how some muscles are overly stretched and under-streghtened (such as the hamstrings) while the antagonistic muscles are trained too hard, but not stretched enough (quads). Such musculature imbalances can cause injuries in the long run. I also covered some three step-sparring and explained the importance of angle-and-distance / positioning. I opened the Potchefstroom Dojang in 1998. Seventeen years later it is still active and while not a particularly large school, it is nonetheless still going strong. 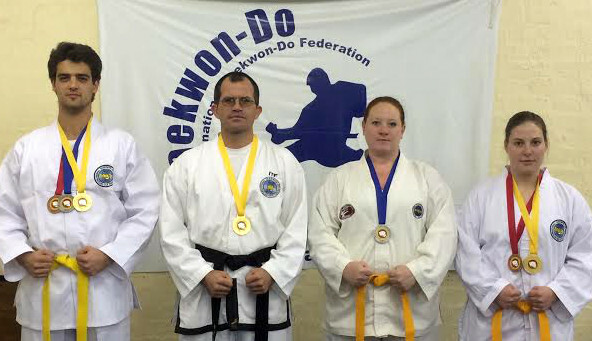 The numerous medals won during tournaments last year is just one indicator that the current Potchefstroom Dojang instructor, Mr Philip de Vos, is doing a great job. I was pleased to present Bsbnim Philip with a black belt that I had embroidered in Korea just before I departed for South Africa with his name and "III" in honour of his promotion to 3rd degree black belt recently. I also presented the Potchefstroom Dojang with a new set of focus pads, which I'm sure will come into good use.